Space Wolf characters are quite easy to convert from plastic. 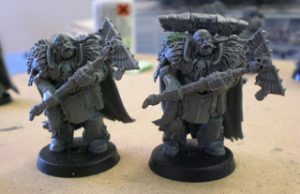 In this simple guide Adam from the old Space Wolves Blog going to show you how to convert Space Wolf characters using components mostly from just 2 boxed sets. Please note this post is from 2010 and new packs have become available that will allow you to make even more options. We will feature even more Space Wolf Character conversions in the near future. 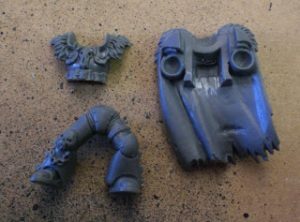 Many of the Space Wolf character models are a nightmare to get hold of, which makes them either extremely rare, very expensive or a bit dated. Most of the character were sculpted in the tail end of 1st edition Warhammer 40K! So it’s much easier if you can make your own characters from the plethora of plastic kits available. If you want all the fancy bits, you’ll also need the frost axe, a head and crux terminatus on a chain from the Space Wolves Terminator box. 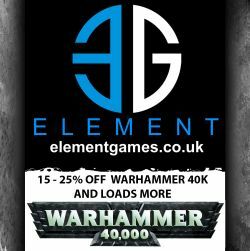 You’ll also need a loin cloth, purity seals, gun holsters and pouches from the regular Space Marine Tactical Squad box. 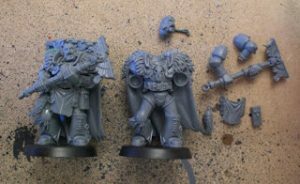 If you’re building a whole Space Wolves army, you should have all these bits anyway, so it’s not quite so expensive as it would be. 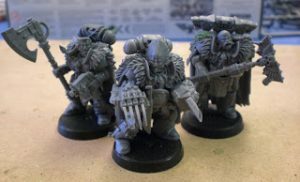 In fact, all you probably need to buy in addition to your collection of bits is the Chaos Warriors box, which makes these characters reasonably affordable if you think about it. 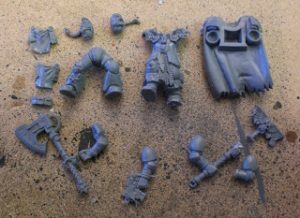 The first bits you need are a pair of Space Marine legs, a Chaos Warrior torso front and a Chaos Warrior body with cape. It’s also worth gathering a selection of weapons, arms and head. Spare arms are a must for these conversions because the arm holes on the Chaos Warrior body can be very restricting on the poses of your models. 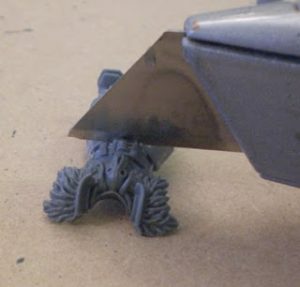 First up, you take the Chaos Warrior body with the legs attached, line your knife up along the underside of the belt and cut a neat, straight line through it. Then tidy up any wibbly edges with your knife. Don’t worry if it’s not perfect, the lower bit is going to be covered in accessories to hide a horrible joint anyway. You may want to be selective about which Chaos Warrior torso you use for which character. I’m going to demonstrate how to make a Wolf Priest, so I’ve chosen the chest peice with a wolf skull in it. Next you need to cut the line of plastic out of the Chaos Warrior cloak. You can see from the white marks where I’ve dug it out with a modelling knife. Cut straight down the sides, then keep cutting out triangles until there’s virtually nothing left. Carve the rest out with your knife blade until it’s almost flat. It doesn’t have to be perfect. Now you need to glue the front of the Chaos Warrior torso to the Chaos Warrior cloak and glue the Space Marine legs on to a base. Once these are dry, it’s worth holding them together to get an idea of how the body is going to go together and what the cloak is doing. Sometimes you need to chop the arse off the Space Marine legs so the cloak flows straight down and the torso lines up on top of the legs nicely. Once you’re happy with it, glue the two pieces together. It’s worth having some parts of the cloak touching the back of the Space Marine legs. It just increases the strength of the model, which is important for someone like me who travels around with their army and plays a lot of games. My miniatures have to be quite robust -hence my preference for plastic. Once the body is together, it’s time to add the arms, head and accessories which will be used to cover that nasty join between the belt and the legs. This is where the big loin cloth from the Space Marine Tactical Squad box comes in handy along with a large pouch (also trimmed from the tac-squad box) and a wolftail talisman. I’d better mention that the double-handed Crozius the Wolf Priest is wielding is the double-handed power axe from the Space Wolves box with the axe head chopped off and replaced by a suitably wolf-like skull with wings. Now you can see how the loin cloth and other accessories can cover all the nasty bits I don’t want you to see. 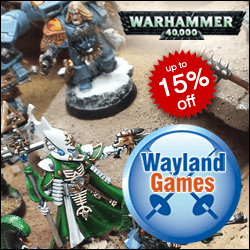 Now you have a use for all those accessories Games Workshop include in their boxed sets! Once the accessories have been stuck on, you need to add the arms. This is really quite tricky and I…er..’bodged’ it a bit and glued on some purity seals to hide the nasty joins. My Wolf Priest actually has two lots of elbow armour. The Chaos Warrior elbows and then the Space Wolf arms glued on from the elbows. Fortunately accessories and a little bit of green stuff can cover this to. Finally, you need to stick on the Space Marine back pack. It’s a little harder than you think, because it needs a flat surface to glue on to. Hold it up to the back of the cloak (once your model is fully dried) and then cut away the fur on the back of the cloak where you want to glue on the Space Marine backpack. Once you’ve got a relatively flat surface, glue it on. Obviously the more rounded bit at the top will stick over the lip of the Cloak collar. Here’s my Rune Priest and Wolf Priest from earlier alongside a Wolf Guard Battle leader armed with a pair of wolf claws. I’ve used a similar technique to make him, but used some different Space Wolves accessories to cover the join between the Chaos Warrior torso and the Space Marine legs. I also gave him some Khorne Bezerker legs to be different. So there you go. Some simple and effective Space Wolf character conversions. Really good informative post! Thanks o think il be using this site a lot!